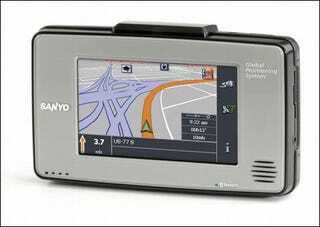 Getting lost should be a thing of the past if you've got Sanyo's new GPS by your side. The NVM-4030 is a portable, voice-guided GPS system pre-loaded with over a million points of interest all saved on the system's 1GB SD card. It has a 4-inch touch sensitive LCD along with built-in Bluetooth for hands-free calling. The system can also play MP3s and WMAs stored on an SD card. We can barely drive through our neighborhood without getting lost so this should keep us in check, and at $399 it'll leave us with money for gas.